I want to express my sincere gratitude towards A A SHAHs IAS Institute (Mumbai) especially Bilquees Mam. I joined the coaching in 2010 when I was in IIT Bombay. She was the one who guided me during the initial stage of preparation. It was where my foundation for civil services started building up. Through the classes and insights provided by Bilquees mam, My resolved of choosing civil service became more firm. I would be always grateful to the Institute for my success. 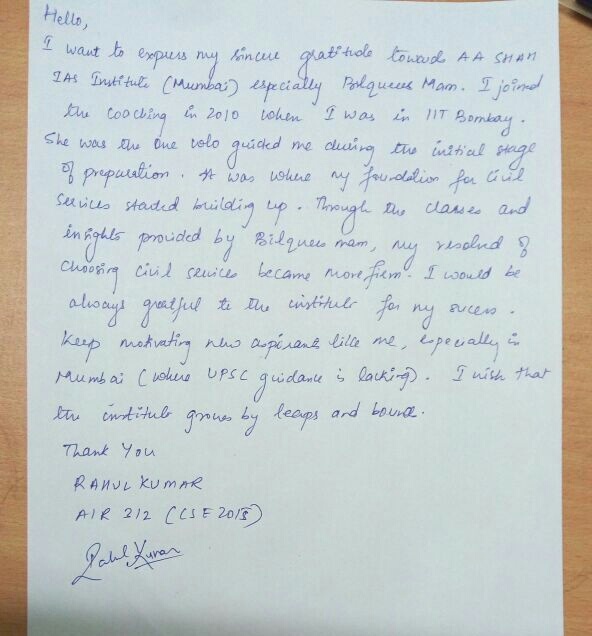 Keep motivating new aspirants like me, especially in Mumbai (Where UPSC guidance is lacking).I wish the institute grows by leaps and bounds.